Nghe An (VNS/VNA) - Shan tea, a type of wild tea tree grown by ethnic minorities, has been well known in the mountainous provinces in the north of Vietnam for many years. But little is known about a large Shan tea area in a remote mountainous district of Nghe An province in central Vietnam. Profits from the tea have become the main source of income for local people from the H’mong ethnic group in Ky Son district. About 15 years ago, Ky Son district was the poorest in Nghe An province. The ethnic minority people there grew marijuana to generate money. A group of volunteer war veterans from the province was assigned the task of helping locals improve their livelihoods. 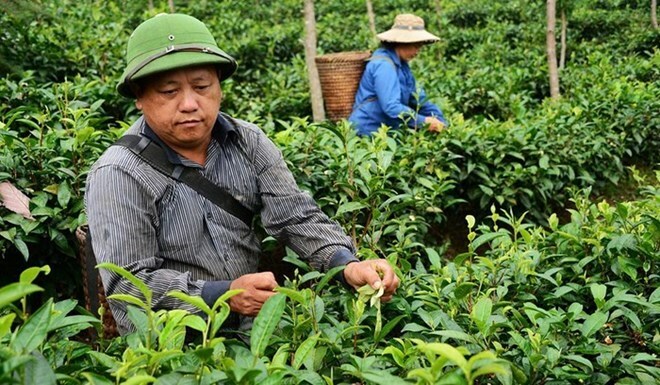 “We decided to grow Shan tea because of its short cultivation time and stable income that it can bring farmers,” Vuong Xuan Tru, deputy head of the group told Thanh Nien (Young People) newspaper. Shan tea has been grown in the mountains of the northern provinces of Ha Giang and Yen Bai at a height of 1,200m above sea level or higher. Realising the villages in Nghe An are at the same height, the group brought the tea seedlings to Ky Son, taught themselves how to grow, harvest and preserve the tea, before teaching local farmers. Thanks to fluctuations between day and night temperatures and steep hills, Shan tea grows rapidly on the mountain without fertilisers. More and more households then realised the benefits of the tea and gave up growing marijuana and switched to Shan tea. Until now, more than 400 households in Huoi Tu and Muong Long communes in Ky Son district are growing the tea. The growing area then was expanded to the districts of Anh Son, Thanh Chuong, Nghia Dan and Con Cuong. The more than 1,000 ha of Shan tea grown in Nghe An has become one of the biggest Shan tea cultivation areas in Vietnam. The tea has helped ethnic minority farmers get out of poverty and improve their livelihoods. Pham Duc Trinh, former deputy director of Anh Son Tea Factory, one of the war veterans who came to Nghe An and taught locals to grow the tea, said that Shan tea from Nghe An and other northern provinces share similar features. But wind and fog of the mountainous weather conditions make the Nghe An tea taste sweeter and smell better than other types. Almost all households in H’mong villages grow Shan tea and drink the tea every day. A common health tip among locals is to chew fresh, bitter-tasting Shan tea leaves to cure stomachaches. Phan Thi Hong, a local in Cao Son district told Thanh Nien newspaper that taking care of the Shan tea plants is simple without having to water or fertilise them. “Each day I harvested about 50 to 60 bunches of tea, each of them sold at 7,000 VND (0.3 USD) for wholesale traders and 10,000 VND (0.4 USD) for retail buyers,” she said. Nguyen Van An, a tea growing instructor, said that the Nghe An Shan tea is completely free of chemicals. Nguyen Thi Anh Hong, deputy head of the Vietnam Tea Association, said that the Shan tea that is famous in northern mountainous provinces has been successfully applied in a central province like Nghe An.